Helen Maher discovered her first accordion in the attic of her music college digs. From that dark and mysterious first encounter has emerged a bright, entertaining style that offers delicately haunting touches. With vocals to match, accordionist Helen treats audiences to performances that are bubbly, beguiling, and backed by years of musical training. Moving easily between a range of genres, including French Chanson, Gypsy Jazz, Folk, Russian and Classical to name but a few, she can easily tailor her playing style and appearance to the setting. Amongst the notable names she has played alongside are Pete Best, Turin Brakes, Mick Jones (The Clash), The Farm, Jez Wing (Echo and the Bunnymen), Pete Wylie, The Jive Aces and world-class Gypsy Jazz players like Gary Potter and Fapy Lafertin. Helen is based in the musically acclaimed city of Liverpool and available for performances across the UK and beyond. Helen can appear as a solo performer or as part of a duo or band, thanks to established musical partnerships. 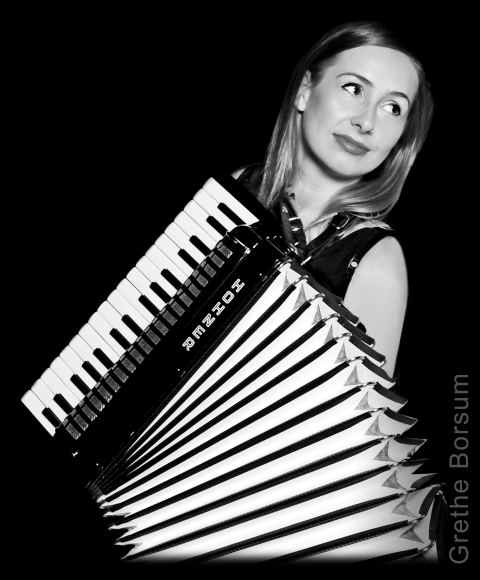 Please get in touch to book Helen for private parties, public performances, corporate events, weddings, session work and teaching (both accordion and piano tuition).